I'm back today with the last post in this three-part fall wardrobe basics series. I'm sharing the essential shoes, earrings and accessories for this season. I am a big shoe person so of course I own many more Fall shoes than these, but if I had to narrow it down to easy everyday wear and mix and match-ability, these are definite winners! 1. Backpack - As a mom on the go I swear by a backpack. I also have a work tote, but on weekends and trips to the zoo or the park, a backpack is a must. 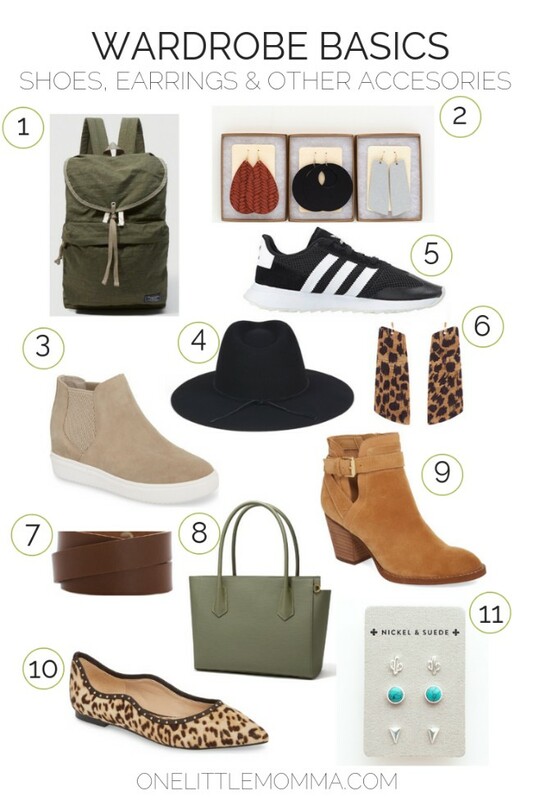 I love a green or gray bag and I've had everything from a canvas to a faux leather bag. Plus backpacks are just cool! 2. Rust Knit, Black Nova, and Silver Leaf Earring Set - I designed this earring set to be the perfect fall essentials. These colors, shapes and textures should go with almost any Fall outfit. I always wear size large, but mediums are what I recommend! And as always, Nickel & Suede earrings are always super lightweight and nickel free. 3. Casual Sneaker - I love sneakers and a casual sneaker is perfect for everyday wear. A great pair of Converse or something similar will go with almost any casual outfit, including a casual dress. 4. Fedora - I've always been a hat person, especially fedoras! This season Nickel & Suede has several perfect basic wool fedoras and you can't go wrong. I wear this black one all of the time, but this brown one is also super versatile. I'm a big believe that even short haired women can wear hats, but you do need to be able to see some hair. Push your bangs down in front or do something to see that you DO HAVE hair. Also, I think the key to wearing a hat is just owning it. It might feel like a bold step for you, but everyone will admire you for doing it! 5. Black Sneaker - This is such a must. I literally wear these all day every day, to work out or to just live. I love that a basic black sneaker is totally chic now and works with so much more than workout clothes. Wear them with a sweater, your denim jacket, a leather jacket, black jeans, blue jeans, etc. Just make sure they are "mostly black" with a white or gum rubber sole. I don't mind the white stripes or swoosh on the side either. But think sleek and less is more. 6. Cheetah Cork Earrings - These are one of my other favorite pairs of N&S this season. They add a pop of pattern to an outfit and work well to do some pattern mixing too. Wear them with your stripes, your camo jacket, your solid sweater, your graphic tee- it all works! The only thing I wouldn't pair them with is more leopard/cheetah. 7. Wrap Cuff - This cuff style is a big seller and no wonder. It looks so cute on and it's comfortable. I would snag it in color London Tan, Black or both. 8. Tote - I do think aside from a backpack that a little dressier tote is necessary. It could be a Madewell tote or the one pictured above. I'm not going to be out of the little kid stage for a while, so I still have a lot to carry- plus I often take my planner or my laptop with me. This is the type of bag I take to meetings, work, church and more. 9. Heeled Ankle Boot - I know flat ankle boots are popular, but I think a boot with a bit of a heel is more versatile. I always get a block heel and don't have a problem walking or running after kids in 1-2 inches. I have found that the more expensive options are a lot more comfortable though. This is a boot I would invest in because you'll wear it so often if you love how it looks AND how it feels. 10. Leopard Flat - Flats are always easy, and a leopard flat is another way to add pattern to your wardrobe. You could also do a plaid flat or a bright color. Make sure these fit well and stay on your foot and you'll wear them all the time. 11. Silver Stud Earring Set - This season we added studs to our Nickel & Suede Collection. This silver set is my fave, but the gold one is so pretty too! These studs are all Sterling Silver, or 14 karat gold and they are just the right basics. Wear these in second holes, to the gym or with a minimalist outfit. I hope you found these three Fall wardrobe staple posts helpful and I'd love your feedback. What do you want help with? What other holes are you struggling with in your closet?